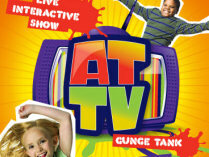 A new show entitled "ATTV" is now being hosted in the Cred Street Theatre, and we've been to check it out. The concept of ATTV is that you're in the audience for a game show being filmed at Alton Towers. Four people volunteer to be in each show (two girls and two boys), and the audience has to help them out with the various challenges they are given. Rounds include "Whose ride is it anyway? ", where the contestants have to guess which ride it is that's being described by another guest, and "Cold Shoulder", where they have to try and put on a t-shirt that has been in the freezer for some time. There's even an obligatory gunge tank at the end. We thought the show was great, with plenty of audience participation and a fantastic prize for the winner: a Family Annual Pass to the park. It's definitely worth seeing in our opinion, and the show is running daily until 2nd September (at 12:30pm, 2pm and 3:30pm) so you've got plenty of time to catch it. You can see some photographs taken yesterday from in and outside the theatre, and we've also added a cut-down video of the show in our Multimedia section. Enjoy!